Loki and Freya and trolls, oh my! A day at the lake sends 10 year-old Princess Silya and 11 year-old Princess Hedda on an adventure filled with Norse mythology and legend. These resourceful girls rely on their own quick wits, curiosity, and intelligence to help each other survive Loki’s evil plot. And they aren’t afraid to get help from the adults they encounter along the way, either. 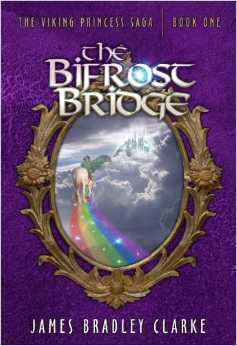 Truly age-appropriate and still very true to the tween mindset, this story treats the reader to a fun romp in an ancient Nordic setting, complete with beautiful old-world style illustrations. I seriously hope Mr. Clarke writes many more of these brave princesses’ adventures, and soon!